[Photo courtesy of Brad Searles] Shows like Sunday's at Allston landmark Great Scott are the reason why our favorite bands seem to be getting more press in, say, Pitchfork than the Boston media these days. The bill alone speaks volumes for the admirable diversity of our beloved little scene: there were the paranoid insectoid ruminations of Krill, the brash punk stylings of the hotly tipped Potty Mouth, and the whip-smart post-punk jams of Bent Shapes. It was the latter act's release show, and Bent Shapes certainly brought that nebulous "it" live in a big way. 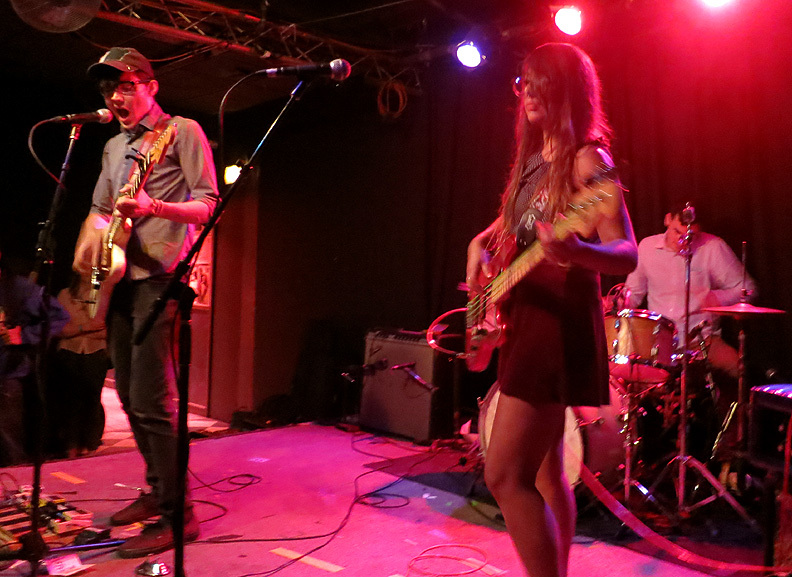 Much to our delight, Potty Mouth and Krill also delivered memorable sets. Bent Shapes took the stage a little after 11 and quickly brought the proverbial house down. The trio's new record Feels Weird -- out today and now streaming at Pitchfork Advance -- is incredible, a hard-earned tour de force from one of the best indie pop band in Boston. They wear their influences proudly, to be sure, but the true appeal to Bent Shapes' fizzing sound is its tight songcraft, a trait that dates back to its early days as Girlfriends. Songs like "Big Machines" and set closer "Behead Yrself Pt. 2" neatly cram melodies and counter-melodies into shiny, breezy post-punk nuggets. None of that gets lost in the act's live show, either. Stripped of some studio polish, the songs register with even more conviction, all strained vocals and loud, crashing cymbals. Out-of-towners might not realize, and the unfamiliar wouldn't know it from the pop euphoria of Feels Weird, but Bent Shapes are veterans of the city's basement scene and were right at home on a small stage like Great Scott's. The show not only felt like a victory lap for the group, but also seemed to celebrate how far the Boston scene in general has come of late, especially this summer. At the end of it all, Bent Shapes had a totally rad encore walk-on moment, too -- not bad for a Sunday night in late August.